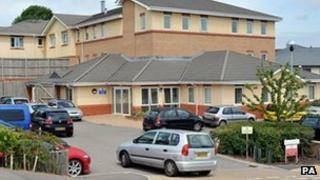 Another Winterbourne View care home scandal could happen again unless action is taken by the government, campaigners have warned. Mencap and the Challenging Behaviour Foundation have spoken of the risks of moving patients hundreds of miles. The warning comes as the results of a serious case review into the abuse of patients at the private hospital near Bristol are due to be released. The abuse was uncovered during secret filming by the BBC Panorama programme. Eleven people have admitted charges of ill-treatment and neglect related to the abuse. South Gloucestershire Safeguarding Adults Board (SAB) commissioned the review, carried out by an independent expert. Mencap and the Challenging Behaviour said they had received 260 reports from families concerning abuse and neglect in institutional care since the Panorama programme was aired in May last year. Their joint report - Out of Sight - detailed a number of serious incidences reported by families, including physical assault, sexual abuse and the overuse of restraint. Mencap chief executive Mark Goldring said: "We fear that unless the government commits to a strong action plan to close large institutions and develop appropriate local services for people with a learning disability, there is a very real risk that another Winterbourne View will come to light." There are currently hundreds of people with a learning disability in assessment and treatment units like Winterbourne View, the charities said. Many of these are located hundreds of miles from home, where people are at particular risk of neglect and abuse, they added. Vivien Cooper, founder of the Challenging Behaviour Foundation, said they had "deep concerns" over patient "safety and welfare". "Many hundreds of people with a learning disability are being sent away to care institutions hundreds of miles from home, where they remain for years unnecessarily, at risk of neglect and abuse," she said. A Department of Health spokeswoman said: "We are clear that wherever possible people should be supported to live in their own homes within their local community. "In a small number of cases people might need access to good quality assessment and treatment services which might include some short periods of in-patient care. "However this is not a substitute for high quality care within the community. "It is vital all services are commissioned properly, reviewed regularly and not used as a long-term solution." Twenty-four patients were transferred from Castlebeck-run Winterbourne View, near Hambrook, following the BBC investigation. The hospital was closed the following month. The criminal charges related to five patients at the hospital. All the defendants are awaiting sentence.